Just to let you know that I have purchased a number of cables from Cable Chick and will always try this site first. Good and prompt service and delivery. 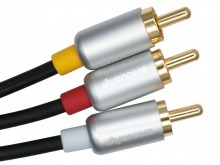 Avencore Crystal Series 3xRCA Composite Video AV cables are a perfect match for your SD/analog hardware and other CVBS video + stereo audio RCA home theatre devices! Composite Video (CVBS) and Stereo RCA used to be the go-to standard at the dawn of the home entertainment revolution, and it persists to this day on many devices which seek to support the full range of video inputs and outputs. More often than not, these special devices are critical, and ensuring the best possible picture and sound quality is essential. 24AWG cores are protected by individual PVC jackets and terminated with gold-plated contacts and aluminium plug barrels, so Avencore Crystal Series cables look their best inside and out. Image and audio quality will always be at their peak! Avencore Crystal Series 3RCA AV cables can work with all RCA interconnect types including Component Video and SPDIF Digital Audio (its just the colour-coded strain relief collars won't match your equipment sockets). So you can rest assured these are made to the best specification for all home and office applications.